Brewing is the multistage process of making beer and other alcoholic malt beverages. Brewing has taken place around the world for thousands of years, and brewed beverages are staples in the diets of many cultures. Although the main modern ingredients in beer are water, barley, hops, and yeast, people have brewed with products as varied as rice, corn, cassava, pumpkins, sorghum, and millet. Egyptians, Greeks, Romans, Chinese, and Inca also made beer. These early people may have discovered the basic processes of brewing when they observed—and then tasted—what happened to fruit juices or cereal extracts left exposed to the wild yeasts that naturally float in the air. Over the centuries, breweries sprang up throughout Europe where there was good water for brewing. During the Middle Ages (400–1450), monasteries became the centers for brewing, and the monks originated brewing techniques and created many of the beers still popular today. Bottled beer was introduced by the Joseph Schlitz Brewing Company in Milwaukee, Wisconsin, in 1875. The Gottfried Krueger Brewing Company released the first canned beer in America in 1935. Ale: A top-fermented beer that until the latter part of the nineteenth century was not flavored with hops. Fermentation: Process during which yeast consume the sugars in the wort and release alcohol and carbon dioxide as byproducts. Hops: Dried flowers of the vine Humulus lupulus, which give beer its characteristic bitter flavor and aroma. Lager: A traditional Bavarian beer made with bottom-fermenting yeast. Malt: Barley grain that has germinated, or sprouted, for a short period and is then dried. Wort: The sugar-water solution made when malted barley is steeped in water and its complex sugars break down into simple sugars. Yeast: A microorganism of the fungus family that promotes alcoholic fermentation and is also used as a leavening (fermentation) agent in baking. 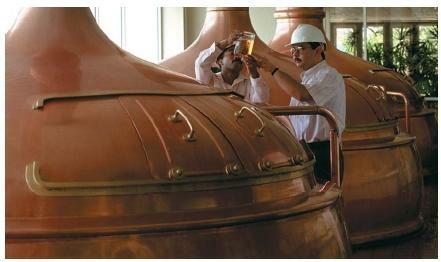 The basic steps to brewing beer are malting, mashing, boiling, fermentation, aging, and finishing. During malting, barley grains are soaked in water until they begin to germinate, or sprout. The brewer then removes the grains and quickly dries them in a kiln. The dried barley grains are called malted barley or just plain malt. During the mashing phase, the brewer mixes the dried malt with water and heats the mixture until the starchy components in the malt are converted and released into the mixture as simple sugars. The malt is then removed from the mixture, leaving an amber liquid called wort (pronounced wert). The wort is then heated to a boil and maintained at that temperature for a period of time. During boiling, the brewer adds hops, dried blossoms from the hop plant, which give beer its characteristic bitter flavor and aroma. After the wort is cooled, yeast is added to begin the fermentation stage. These organisms consume the simple sugars in the wort, giving off alcohol and carbon dioxide in the process. The brew is then stored in tanks for several weeks or months while it ages and its flavor develops. To finish the beer, the brewer clarifies the liquid by filtering out the yeast, then packages it in kegs, bottles, or cans. Beer is usually categorized into two types: ale and lager. Ale is made with a variety of yeast that rise to the top of the fermentation tank and that produce a higher alcohol content than lagers. Ales range from fruity-tasting pale ales to dark and roasty stouts. Lager (from the German word meaning to store) originated in the Bavarian region of Germany. Lager, the most popular beer style in the United States, is made with bottom-fermenting yeast. Lager styles include pilsner (a golden beer with a distinctive hop flavor) and bock (a dark, strong, malty beer).